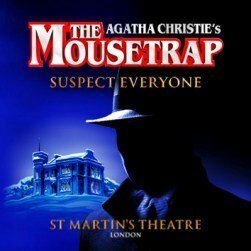 The Mousetrap first opened in 1952 at The Ambassador’s Theatre London and has been running continuously since then. It transferred to St Martin’s Theatre on 25th March, 1974. The Mousetrap is well known as the world’s longest-running play. Tickets have been bought for Agatha Christie’s The Mousetrap for over 50 years. The reputation of this murder mystery masterpiece continues to rise as new generations of theatregoers head along to try to see if they can figure out who is guilty. The scene is set when a group of people gathered in a remote part of the countryside, realise to their horror, that there is a murderer in their midst. Who can the murderer be in this classic? One by one the suspicious characters reveal their sordid pasts until at the last, the nerve-wracking moment when the identity and the motive are finally revealed. The Mousetrap is a brilliant story and an irresistible treat for amateur sleuths everywhere! In her own inimitable style, Dame Agatha Christie has created an atmosphere of suspense and a brilliantly intricate plot where murder lurks around every corner. The Mousetrap has been thrilling audiences for as long as Queen Elizabeth II has been on the throne. Some cast members are in the Guinness Book of Records, David Raven as the ‘Most Durable actor’ for 4575 performances as Major Metcalf, and Nancy Seabrooke for a record-breaking 15 years as an understudy. Join the millions of people who have already discovered who the murderer is but will not share their secret!